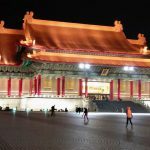 The “Translation” exchange project took place between end of January 2018 and beginning of April 2018 in Vienna, Taipei and Hsinchu. 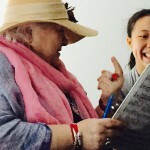 In January 2018 the two composition professors Hsiao-Yin Wang and Chaoming Tung visited the mdw in Vienna, two presentations about new approaches to music theatre in Taiwan were followed by a whole week of individual lessons with the composition students of Iris ter Schiphorst and Reinhard Karger. 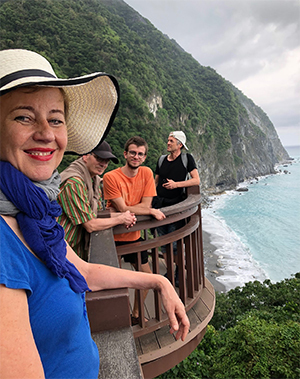 In March/April professors Iris ter Schiphorst and Reinhard Karger spent two weeks in Taiwan presenting their works and those of their students in lectures, workshops and concerts. Before the beginning of my first lecture, the composition “bonds of affection” for pipa and small drum (2016) by professor Tung was performed to give a live example of music theater. After the first lecture, a number of questions were asked which particularly referred to the performance praxis and transforming process of the composition. To elaborate further on the details of the theme of “Music Theater”, individual lessons for students were organized between January 24th and 30th. Professor Tung discussed with the students their own compositions relating to music theater or media compositions. It was a very intensive and inspiring time with professor Tung and all students. 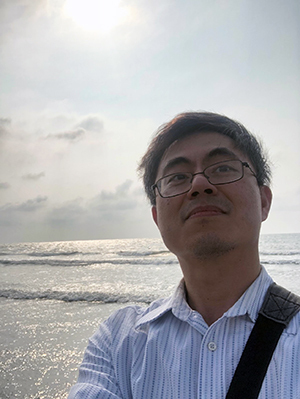 Professor Tung has used his experience with the Asian students on this occasion to pull through a kind of “eastern musical thought” in the compositions of Viennese students and to discover something common in both musical cultures, and to explain something new in this aspect. It was a very valuable project for professor Tung and for the students in Vienna. Professor Tung has expressed his gratitude to professor Karger, professor Schiphorst and all students, and his desire to continue the project! My lecture was entitled “The Elements of the Eastern Music in My Compositions for Music Theater” and refers to the new form of Chinese drum music that I characterize as stage music composition. Props, language, body movements, martial arts, dance, costumes and lighting are the key elements in my music theater, additionally the traditionally spoken drumming texts as musical content. It is about the fusion of eastern and western musical thoughts, which seek to find common understandings in contemporary music and to form the spirit of our time. I thank you very much for this wonderful opportunity to present my works in Vienna, and for taking great care of my accommodation, as well as the entire organization that made this exchange project possible and successful. Personally, I would like to express my gratitude to professor Reinhard Karger and professor Iris ter Schiphorst, who took great care of me during my stay. I sincerely hope that the exchange between the two countries could be continued and look forward to meeting you soon! 1 seminar at the Shi Jian University Taipei about music theatre with mostly chinese instrumental students, very lively discussions about the topic. Concert at the Goethe Institute Taipei (the concert was sold out! ), live performance of “An Joseph Roth” for clarinet solo by Reinhard Karger, performed by Uros Rojko, and “10 miniatures” for clarinet and accordeon by Iris ter Schiphorst, performed by Uros Rojko and Primoz Parovel, video presentations of “also dann”, music theatre for 2 actors and 2 pianos by Reinhard Karger and “Sinfonie einer Großstadt”, a film by Thomas Schadt with orchestral music by Iris ter Schiphorst and Helmut Oehring. This was my third exchange project with artists in Taiwan and again I was stunned by the intenstiy of the discussions and the curiosity of our partners (Jessica Wang, Gary Wu, Huikuan Lin, Chaoming Tung, Kueiju Lin). Everything was perfectly organized, and we felt warmly welcomed and overwhelmed by the friendlyness of the taiwanese people. Spontaneously some new ideas for future projects emerged, and we all hope to be able to continue our common adventures! On 26.3. 2018 at 6 o’clock in the morning we arrived in Taipei. ‘We’, that is: Prof. Reinhard Karger, his wife Verena Joos and their son Willy, as well as my partner Prof. Uros Rojko, my son Philipp and I myself (like Reinhard Karger Professor of Media Composition at the mdw). 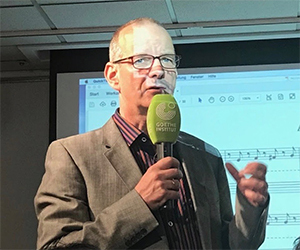 Prof. Karger and I had been invited to Taiwan through a project of the Eurasia-Pacific Uninet academic university (EPU) to hold seminars on ‘music-theatrical aspects in New Music’ in various universities across the country. Since the work of Prof. Karger is closely interwoven with that of writer Verena Joos, it seemed a good idea for them to travel together. The same was true for Uros Rojko and me: because Uros Rojko is not only an outstanding composer, but also an excellent clarinetist; and exactly in this capacity we needed him on this journey: in the concert of the Goethe Institute at the end of our first week he should perform a work by Reinhard Karger, as well as one of my works. One of our hostesses, Huikuan, picked us up from Taipei airport after a 13-hour flight on early Monday morning and first took us to the very pleasant First Hotel. After a short break, however, we left again, because we had date for lunch with the artistic director of the Chinese Culture University Taipei Gary Wu and some of his colleagues. 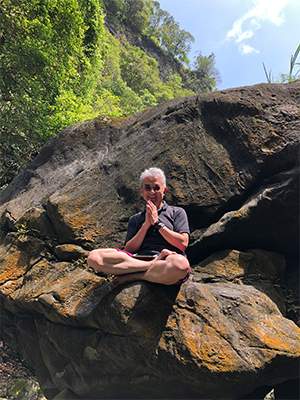 The Chinese Culture University is located on a mountain with a wonderful view of Taipei and is built in traditional Taiwanese style, incredibly impressive for Europeans. After lunch we gave our first seminar on ‘Theatrical aspects in new music’. 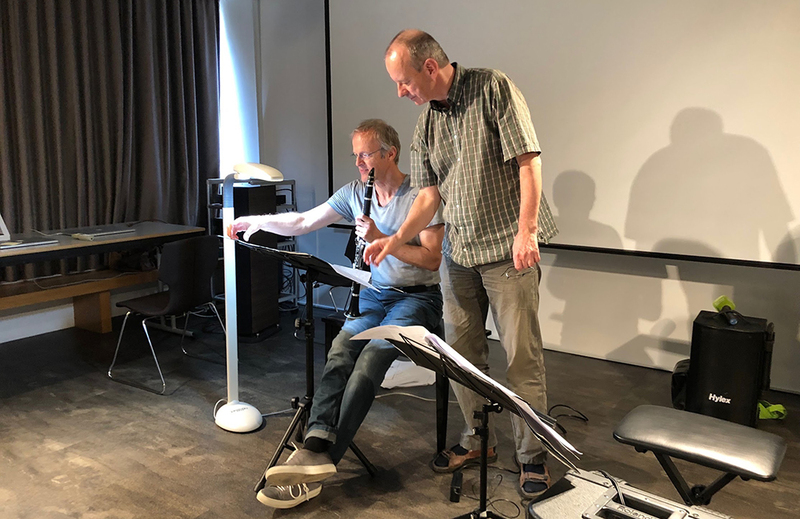 First we showed excerpts of our own music theatre works in video format (as a precaution we had made Chinese subtitles) and then talked about dramaturgical and compositional details. The students were very interested and there were lively discussions. Afterwards our colleagues showed us the beautiful area of the university (the National Park of Taipei is not far away from the Chines-Culture-University). It was exciting for us how much the air smelled of sulfur, something normal for the locals, since the island consists of volcanic rock and still it is rumbling below the surface; depending on the weather sulfur odors are rising up from the earth and cover the whole city with their smell. The next day we took a taxi to Chiao Tung University in Hsinchu, where we also gave a seminar on our topic. Again, the discussion showed how interested the students were. 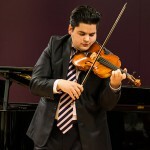 It was pretty unusual for us to see how heterogeneous the group was; it consisted not only of composition students, but also of instrumentalists, directing students and computer scientists. After the seminar, our host Chaoming took us to the famous fish market at ‘Hsinchu Harbor’, an especially memorable experience! Innumerable, sometimes unknown, specimens of marine animals were offered for sale in a huge hall, including snakes, dreadful big crabs, and frogs. We were allowed to put together a lunch from this offer, which was then prepared on the floor above by knowledgeable cooks and finally eaten by us. Very delicious!! After this experience, we went back to Chiao-tung University, where we gave some insights into the media composition as taught at the mdw. There was also a lot of interest in this topic and who knows: maybe some students will eventually come to Vienna to study at the mdw! The next day we took a taxi to Shi Jian University in Taipei, where we met a colleague named Kueiju Lin, a composer who researches and experiments in the field of new music theater (among other things, she develops robot-like instruments together with computer scientist) to stimulate prepared pianos. In our opinion, Ms. Lin had particularly open-minded students in her class, and we suspect that this is probably due to her exceptionally experimental and open teaching. She encourages her students in the spirit of John Cage, to investigate any situation in terms of their music-theatrical aspects and to experiment with all conceivable sounds in the most unusual situations. Anyway, the discussion after our seminar was very lively, which we really enjoyed. Afterwards, Ms. Lin took us to a very pleasant bistro. We exchanged views on the cultural situation of the cities of Vienna, Taipei and Berlin and together we considered how we could bring work from us to Taipei and, conversely, bring the work of our Taiwanese colleagues to Vienna. We will pursue these thoughts. In the late afternoon rehearsals for the concert at Goethe Institute Taipei for the next day took place. 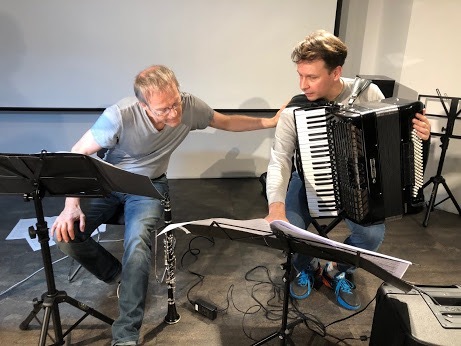 Uros Rojko, who had come with us from Vienna, rehearsed a solo clarinet piece by Reinhard Karger, as well as the clarinet part of a duo for clarinet and accordion of mine, which he should perform together with Slovenian accordionist Primos Parovel. Primos has been living and working in Taipei for six years. The rehearsals went very well because the musicians were so well prepared; so we were very much looking forward to the concert the next day. On Friday, the event started at 7 pm with a small speech by the Institute’s management in the fully occupied hall in the Goethe Institute. The first artistic part of the evening started with the clarinet piece by Reinhard Karger, interpreted excellently by Uros Rojko. After that Reinhard Karger showed a video clip of one of his music theatre pieces. Finally the spectators were asked to ask questions and, fortunately, a lively question and answer situation ensued. The second part of the evening began again purely musically with my duo ‘Miniatures for Clarinet and Accordion’, wonderfully played by Uros Rojko and Primos Parovel. Then I showed excerpts from the film “Berlin: Symphony of a Big City” (made in 2000) by documentary filmmaker Thomas Schadt, to which I had composed the music together with my colleague Helmut Oehring. The visitors were very interested in the film, probably because it shows impressive pictures of Berlin and its inhabitants, and thus gives a pretty good insight into the lifestyle of this city. Finally we ended up in a small bar near the Goethe Institute and enjoyed a drink together with one of our hosts Chaoming and some interested guests; in itself also a wonderful experience, also because our landlady spoiled us with specially prepared dishes. All in all, a wonderful end to this first week.